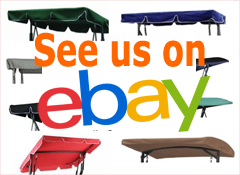 Swing Canopies in a large range of styles, sizes and colours. 130cm x 110cm Replacement Swing Canopy with White Trim. Use the drop-down box to see colours availab..
140cm x 115cm Replacement Swing Canopy with White Trim. Use the drop-down box to see colours availab..
145cm x 110cm Replacement Swing Canopy with White Trim. Use the drop-down box to see colours availab..
150cm x 100cm Replacement Swing Canopy with White Trim. Use the drop-down box to see colours availab..
150cm x 115cm Replacement Swing Canopy with White Trim. Use the drop-down box to see colours availab..
150cm x 125cm Replacement Swing Canopy with rounded top. 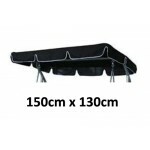 Use the drop-down box to see colours a..
150cm x 130cm Replacement Swing Canopy with White Trim. 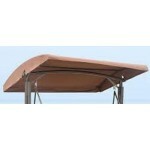 Use the drop-down box to see colours availab..
150cm x 145cm Replacement Swing Canopy with White Trim. Use the drop-down box to see colours availab..
155cm x 110cm Replacement Swing Canopy with White Trim. 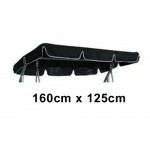 Use the drop-down box to see colours availab..
155cm x 120m Aldi Replacement Swing Canopy with rounded top. Use the drop-down box to see colou..
155cm x 130cm Replacement Swing Canopy with White Trim. 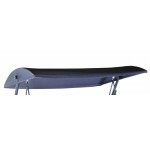 Use the drop-down box to see colours availab..
158cm x 125cm Replacement Swing Canopy with rounded top. 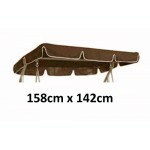 Use the drop-down box to see colours a..
158cm x 142cm Replacement Swing Canopy with White Trim. Use the drop-down box to see colours availab..
160cm x 115cm Replacement Swing Canopy with White Trim. Use the drop-down box to see colours availab..
160cm x 125cm Replacement Swing Canopy with White Trim. Use the drop-down box to see colours availab..